New parents have many questions when it comes to a new baby. Giving your baby water is a common question for new parents. Do not let the fears of parenting affect your confidence in parenting. There are many questions during this new time and it is important to stay educated and read up on different things. Do not hesitate to reach out to your pediatrician if you have questions about your baby’s development, hydration, or health. Do not feel like you are an over-worried, or over-protective parent. An educated parent is a confident parent. “Education is learning what you didn’t even know you didn’t know.” – Daniel J. Boorstin. 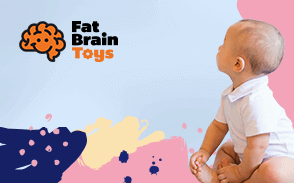 You can give your baby water after you have started to introduce solids into their diet. It is important to not give your baby water if they are under six months old. During this early time, your baby is still receiving the nutrients they need from breastmilk or formula and you will not want to give your baby water if you have not started introducing solids. Giving your baby water when they are under six months old can make them feel full and prevent them from drinking the breastmilk or formula which provides the nutrients they need. Hold off on giving your baby water until after you have introduced solid foods into their diet. Can I give my baby tap water? If your baby is under six months old, you will not want to give your baby tap water. When using water in formula, make sure you have boiled the water, let it cool, and reheated to the temperature appropriate for the formula before giving it to your baby. Using filtered water or bottled water in the formula helps ease the time it takes to prepare bottles for your baby. You should not give your baby tap water if he is under six months only. The U.S. Environmental Protection Agency says that it is not safe to use tap water with your baby’s formula without boiling it first. Keeping bottled and filtered water on hand will make sure your baby is drinking less contaminants and pollutants. It’s very hot out, can I give my baby water? You should not give your baby under six months water if it is hot out. You can make sure your baby stays hydrated by giving him extra formula or breastmilk. You want your baby to drink about 50% more than usual if it is hotter than normal. If it is summertime and you and your baby are out in the weather, you will want to make sure your baby is staying hydrated by giving him more breastmilk or formula. If you are breastfeeding, make sure you are staying hydrated. Breastmilk is made up of water and nutrients. Your baby will stay hydrated if you are letting him feed whenever he wants. My baby has a fever, can I give him water? No, do not give your baby water if they are not weaned. Giving your baby water when they have a fever will not help lower your baby’s fever. If your baby has a fever and she is under six months old, make sure she is getting breastmilk or formula often. You may need to feed her in smaller amounts more frequently. Keeping your baby hydrated will help with the fever, but do not give your baby water if she is under six months old. You will want your baby to be off breastmilk or formula before you give your baby water. Why can’t babies have water? Babies under six months old shouldn’t have water because it affects how much breastmilk or formula they are drinking. Babies receive the nutrients they need from breastmilk and formula. If your baby drinks water, they will feel fuller and drink less of the nutrient-rich breastmilk or formula. Giving your baby water conflicts with your baby getting the nutrition from breastmilk or formula. If your baby drinks water, they feel full and eat less. If they are eating less, then they will not get the nutrients they need when they drink breastmilk or formula. When you start to introduce solids to your baby, you can start to introduce water. When your baby is six to twelve months old, they still do not need water. However, if you start to introduce water to your baby after six months, it will help them get familiar with drinking water. As adults, drinking water is healthy. By introducing water to your baby when you introduce solids, you are creating a healthy lifestyle habit that will benefit your child as they grow up. My sister gave my baby water! Will she be alright? It is not recommended that your baby under six months old have water. However, if your baby is given water, she will likely be fine. As long as it was not more than 2 to 3 ounces, you do not need to have any concerns. It is important to educate the people around you that may be caring for your child. Do not feel like you are being the crazy one and going over all the do’s and don’ts. If you have concerns about what your childcare provider does or does not know, educate. If you are having concerns that your baby was given too much water it is always a good idea to check with your pediatrician. 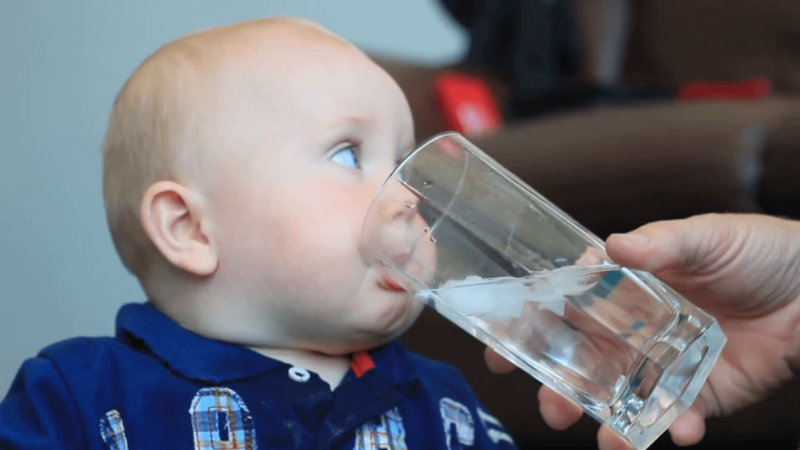 Is filtered water okay for a baby to drink? If your baby is over six months old it is okay to give him filtered water. If you are giving your baby water from a filtered machine like a refrigerator door, tap water filter, or under the sink filter, then you will want to make sure that you are following the guidelines for replacing the filters. If you are giving your baby filtered water from any of these sources and not changing the filter then you may be doing more harm than good. When your baby is over 6 months old, you have introduced solids, and you are reducing the amount of formula or breastmilk your baby is receiving, it is okay to give your baby filtered water. Filtered water from a jug can easily be placed in your refrigerator for your family to drink and is safe for your baby after they are six months old. I think my baby is dehydrated. Can I give my baby water? Signs of dehydration in babies can be scary. If your baby is having less wet diapers, her mouth looks dry, or if you notice no tears when your baby cries, she may be dehydrated. When your baby is dehydrated, you do not want to give her water. If you feel that your baby is showing serious signs of dehydration. Call your pediatrician right away. If your baby is slightly dehydrated, give your baby more fluids. This can be in the form of breastmilk, formula, or an electrolyte liquid from your pharmacy. Parenting is a new and often scary time. Staying educated will help you become a more confident parent and help keep your mind at ease. Giving your baby water is a common question among new parents so do not feel like the questions you have are silly or wrong. Staying educated about your baby’s health is an important part is successful parenting. Do you know someone who is going to be a new parent? Share this article with them so they can feel educated about giving water to a baby.